*We are currently accepting students for 1st-4th grade (6-10 yrs old). We will eventually go to 8th grade. The Great Lessons are a unique feature of Montessori education. These impressionistic lessons, told as stories at the beginning of each year, answer big questions such as, "How was the earth formed? Where did human beings come from? Who invented writing?” The stories provide a foundational framework of the world upon which students can build future knowledge. These lessons are designed to spark the child's imagination, spurring them to ask their own big questions and to delve deeply into topics that capture their interest. If a student, after hearing about the properties of solids, liquids, and gasses in the First Great Lesson, becomes so excited about the topic that they want to research and perform relevant science experiments, the Montessori classroom gives them the space and support to do just that. Mission Montessori’s language program is designed to develop a student’s lifelong love of reading and writing. We want to create fluent readers and coherent, expressive writers, who are able to engage with their interests and the wider world proactively. 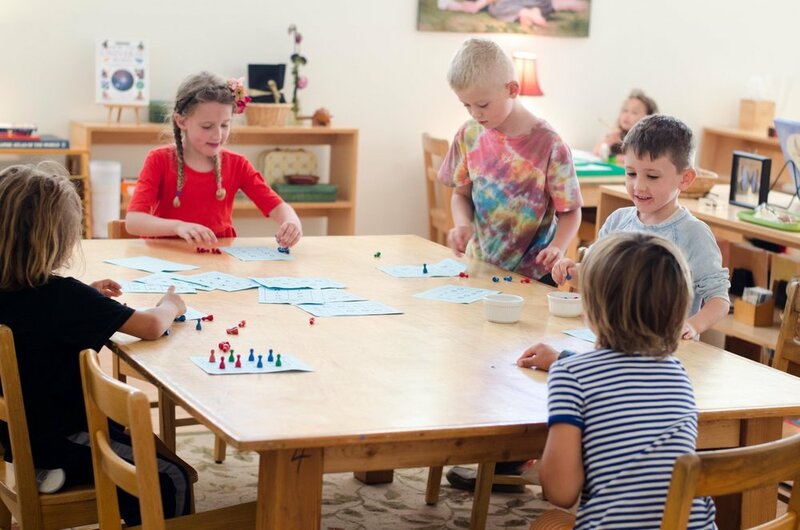 Two ways in which Montessori’s approach to language skills is unique are its incorporation of holistic, kinesthetic learning techniques, and its emphasis on practical, real-world applications. Grammar, word study, handwriting, and vocabulary are mastered via hands-on, whole body activities that engage students more thoroughly than static, rote memorization. Students are frequently encouraged to use their writing and reading skills beyond the classroom, with research and "going outs" at the heart of the Montessori approach. For example, let’s say a student, while studying zoology, becomes interested in the training of service animals. To thoroughly investigate this topic, they’ll need to take notes from non-fiction texts and resources. They may need to look beyond the classroom for the information they need – by writing a letter to PAWS, or contacting an organization that brings therapy dogs into hospitals. In this way, students are reading and writing for an authentic purpose, using their natural curiosity and developing literacy skills to construct a meaningful understanding of the world, and to competently and proactively interact with it. Students are also offered a wide variety of creative writing opportunities: narratives, plays, journal writing, poetry and prose. Elementary aged children are keen observers of the phenomena that shape the world, asking questions about how things work and why things are the way they are. 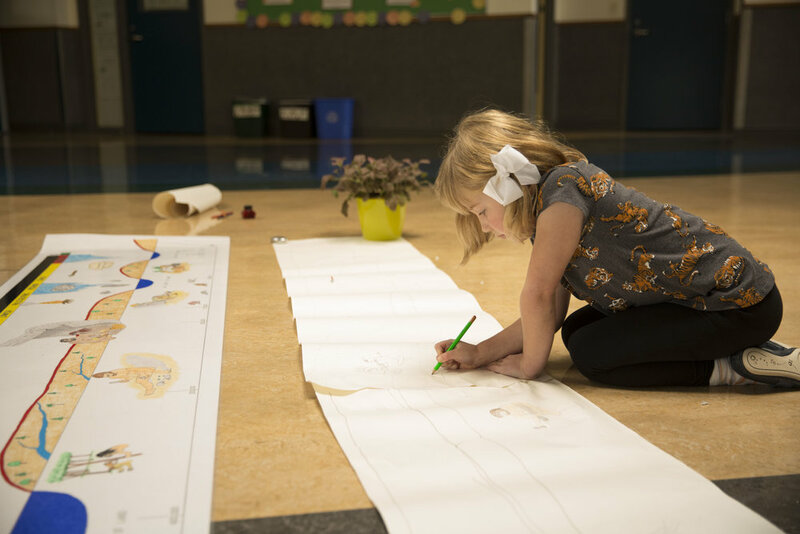 In the Montessori elementary classroom, the teacher nurtures the natural curiosity of her students through the presentation of the five Great Lessons, imaginative and inspiring stories that provide the framework for all studies to follow. The first Great Lesson, The Story of the Universe, introduces many foundational scientific concepts and topics accompanied by impressionistic charts and experiments that help students to understand the natural laws that govern the universe. In the weeks and months following The Story of the Universe, the children will repeat these experiments and go on to perform many more across a wide array of scientific topics including, but not limited to, botany, zoology, physical science, and earth science. It is through this experimentation and exploration that children gain firsthand experience of the natural laws of the universe, coming to a deep understanding that all matter is subject to these laws. They are then able to start drawing their own conclusions about how the world works. The sequence of the child’s work in science follows that of the scientific method: observation, question, hypothesis, experiment, data analysis, and conclusion. In the Montessori classroom, students don’t just learn about science, they themselves become young scientists. The Montessori approach to mathematics is truly unique. Students explore the properties of numbers and mathematical concepts via a “hands on” approach, which gives them practical experience with concrete math materials. This unique approach introduces students to advanced concepts early on. Children from the age of six are able to perform calculations with large numbers - up to millions. Because our program is individualized, a student can practice with the math materials as often and as long as they need to in order to acquire an abstract understanding of mathematical concepts. The key areas of focus in the lower elementary are place value, the four operations (addition, subtraction, multiplication, division), multiples and factors, fractions, geometry, measurement (including time and money), and problem solving – but there’s no limit to where the student can go. Like the language program, math is integrated throughout the curriculum. In the sciences, students use mathematical reasoning as they make observations and record data from their experiments. They use measurement conversion when creating historical timelines to represent periods of time. They record and represent data from social science activities. At Mission Montessori, we teach all students the Spanish language. For students interested in becoming fluent in Spanish, we recommend our Spanish Immersion track where both teachers are native Spanish speakers and most of the learning is in Spanish. In our English classroom, we also teach Spanish language in a variety of ways including: music, Spanish lessons, calendar work, Spanish cultural celebrations and more. Why Spanish? Learn more here. We believe that asking big questions, following a child’s curiosity, and teaching strong academic skills is the key to nourishing a child’s innate desire to learn. The big difference between the Montessori method and other progressive methods is that in Montessori, there is objective, well-thought out curricular content with clear learning outcomes. Montessori strikes the perfect balance between empowering students to independently follow their passions and interests, while also maintaining high standards for the mastery of essential content and skills. While academic standards are high, Mission Montessori’s approach is holistic, with strategies designed to reach every learner. In a Montessori classroom, the role of a teacher is primarily as a guide: to observe students closely and introduce appropriate material when they’re ready. This results in an individualized academic experience that is significantly more customized than in a traditional school. Individual or small group lessons, targeted at each child’s level of ability, are designed to be challenging but attainable, which makes for a joyful and productive learning experience. Check out this unprecedented study on Montessori elementary and it’s academic benefits. Teacher observation is essential in Montessori. The teacher observes when a child is ready to be introduced to a new challenge that stretches them. The pacing of lessons are designed to match each child’s ability, so children are not bored and disengaged because school is too easy, or frustrated and disheartened at being left behind because school is too hard. We actively teach and encourage a growth mindset in children in their approach to their work. We strongly believe that every child can master math and language in the Montessori setting and that, when lessons are paced appropriately, they can grow up feeling efficacious in their ability to learn. We aim for all of our students to be at or above grade level for both language and math. A Montessori classroom is a happy, bustling, collaborative, and social place. Students move freely, communicating with one another as they work together, or focus quietly by themselves. Montessori recognizes that children are in the prime of their social development in their elementary years. The classroom environment is designed for students to learn social skills: resolving conflicts peacefully, through discussion, verbalizing their thoughts and feelings, and coming up with mutually agreeable solutions. Students learn how to effectively collaborate and problem-solve with others. The mixed-age, individualized learning approach of Montessori allows children to view one another’s differences in a positive light. They grow up understanding that children learn things at different times and in different ways. While teachers regularly assess their students' learning, students are not ranked, and there are no letter grades to compare. Students learn to respect and understand one another and their differences. will - working with a friend on the floor, collecting a new activity, preparing their own snack, finding an older child to ask for some help, going to the bathroom - rather than sitting for long periods at one desk. In fact, the very nature of the Montessori materials encourages children to move. Dr Montessori observed that purposeful movement enhances learning; her observation has been confirmed in recent studies. We believe that children should also have lots of unstructured time to play in the fresh air, helping their bodies grow up strong and healthy, and helping them practice the social skills required to play cooperatively with others. Healthy minds and bodies are also supported through occasional cooking projects that extend from the children’s work in the classroom. Cooking provides a rich "hidden curriculum", from language (reading and writing recipes), to math (measuring quantities, doubling or halving recipes), to teamwork. “We are so relieved that our daughter will be able to continue her Montessori education through her elementary years! We have watched our daughter flourish these last two years in a high-quality Montessori preschool. But beyond preschool, there have been no great options here in the city.